Could Nutanix be gearing up for an acquisition? Acquisition hints at Nutanix, go-to-market changes at Zerto, subscription pricing intro at Violin Systems, new SW release at Delphix – yep, it's another storage roundup. Grab a coffee and take five to check this out. Database virtualiser Delphix has added a new version of its Dynamic Data Platform providing added security and other enhancements. Delphix says its new dashboard has been designed to identify any performance outliers to help ensure high performance for all users.This is a set of incremental changes. Mark Peters said: "The list looks reasonable. I would add that it's not just about product – IBM has been 'strengthening its bench' for some time now. That is bearing fruit... plus there's an increased realization (not everywhere, but improving) that adding net-new logos is important, not just servicing the base." Everspin has started selling STT-MRAM chips. STT-MRAM stands for Spin Transfer Torque Magnetoresistive RAM and has DREAM-like speed. Everspin has been developing the stuff for years and has been overshadowed by 3D XPoint. It has recorded revenue for its first 40nm 256Mb STT-MRAM products, made by GlobalFoundries, in the last 2017 quarter and is ramping production this year. 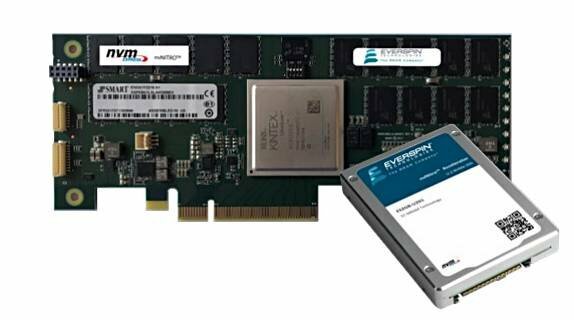 It is working with SMART Modular Technologies on an nvNITRO NVMe storage accelerator, an MRAM NVM Express Card, which is being pitched at the financial technology market. The two suggest it can deliver a 90 per cent reduction in latency for financial transaction logging, through having consistently low latency of under 10µs, with virtually no tail of longer latency transactions, and endurance of 1,000,000,000+ cycles. Download a 13-page paper on this here. This looks to be a specialised and, by implication, relatively expensive device – hence the fintech focus. Nutanix has raised $500m through a convertible note offering. Wells Fargo senior analyst Aaron Rakers says this gives the company an $850m cash pile and wonders if merger and acquisition activity is coming. A Nutanix spokesperson said: "Nutanix intends to use a portion of the net proceeds of the offering to pay the cost of the convertible note hedge transactions... and to use the remaining proceeds of the offering for general corporate purposes, including working capital, capital expenditures and potential acquisitions. "From time to time, we evaluate potential acquisitions of businesses, technologies or products. Currently, however, we do not have any definitive agreements with respect to any pending material acquisitions." Violin Systems, the out-of-bankruptcy and renamed Violin Memory, has announced a subscription programme. Customers can buy product directly through the company, with a set monthly acquisition fee from Violin's leasing partner, or via a cost-flexible subscription model starting from 1 cent/GB/month, which includes Gold-level support. Standard buying options include both outright purchase and pay-as-you-grow offerings with smaller upfront fees and additional capacity invoiced over time. Lease options are available after qualification from Violin's preferred financial partners. The subscription model allows organisations to pay on a monthly basis for storage used. All options include support, installation and optimisation as part of the purchase price. Violin Systems is expanding its international presence and promoted Georgine Nordin to be VP for international alliances, from being VP for worldwide field operations. Zerto has laid off its entire Nordics team, led by Robbert Ravenshorst. The company said this is a shift in EMEA investments. The 2018 EMEA GTM is focused on cloud at a regional level and is hiring two cloud team members to operate across EMEA and develop relationships with CSPs. In Nordics, it said, there wasn't actually an office and this shift of investment affected three employees. Zerto will continue to drive business in the Nordics with channel partners like Proact and others and will continue to provide support for customers through the global support team as always. Growth plans for 2018 are focused on strategic partners and regions and the company is increasing resources and investment in key regions including US and Canada, the UK, the DACH region, France, Benelux, Italy, Japan, and Australia/New Zealand. It says it is also hiring across the company where needed. Synology UK has appointed Nicole Lin as managing director, taking over from Yi-Lin Huang, who moves to Synology HQ in Taiwan. She was previously working in product management and marketing at the Taiwan HQ. In-memory data grid supplier Hazelcast said it experienced 135 per cent year-on-year growth in Hazelcast IMDG usage. It hasn't supplied revenue increase numbers, though.